This is part 3 in a series on how to write so as to reward children for the work they put into reading. If you're new to this series, here's Part 1, which covers the key way in which kid-readers are different from adult readers plus tips for the very youngest audiences, and Part 2 which covers picture books, early readers, and "training wheel" books. Next week we'll finish up with young-adult books, but this week we're looking at books for kids 8 to 12 or thereabouts. The boundaries are slippery; maybe as young as 7 for precocious readers, and up to 13-ish for kids who have been slower to get into reading. 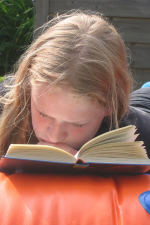 Kids in this middle-grade range are for the most part independent readers, reading more or less without any help. Chapter books get their name from being the first books kids read independently and are large enough to be broken into chapters. Perhaps not the most creative name in the world, but there you go. Chapter books can have illustrations, but many don't. When they do, the illustrations are typically less than a full page (often with text flowing around them), and only every few pages or so. Story-wise, the themes can range from serious to silly to sublime, though on the whole silliness starts to play a lesser role in chapter books than it did for younger age groups. More on that in a bit. For chapter book readers, the act of reading is noticeably easier than when these kids were younger. They may not be especially fast readers yet, but they're not struggling with the basics anymore. While there is less overt humor in chapter books than in early readers and training wheel books, it isn't gone entirely. There's still plenty of humor present, it's just not the motivating component of reward anymore. The majority of the reward comes from classic story elements of drama, concern, excitement, curiosity, and resolution. For us as writers, the most relevant component of work in chapter books is readers' confidence. If all you've ever read on your own are early reader books like Frog and Toad (see last week's article), a 100+ page chapter book can seem quite daunting. The hard part for kids is overcoming their disbelief that they even can read such a thing. Of course we know they can. It's a difference in quantity of work, not in type of work. But try telling that to a kid who thinks the book is too big for them; no amount of rational argument is going to change that attitude. You can't tell people how to feel. For them it's daunting, so when they finally do it, it's a big deal. Thus there is an internal component of reward in chapter books that echoes the goal-achievement rewards I talked about back in part 1: pride. This is what affects how you write the story. I've seen in my own kids the pride they feel when they finally do read a chapter book by themselves. It's a beautiful thing, and I have no reason to think my kids are somehow special in that way. I expect all kids feel that pride, as they should. Facing down the daunting challenge of all those pages is a real accomplishment. But you can't rely on pride to get a kid through your book. Partly because they'll never admit to that pride, because that would mean admitting they felt daunted in the first place. Second because the pride wears off quickly after their first chapter book, and you have no guarantee that yours will be their first. But mostly you can't rely on the pride because if your story doesn't reward them page-by-page, they won't finish the book at all. If that happens, you'll have given them a negative reading experience, which they're more likely to blame on themselves than on your crappy book. You'll leave them thinking "Oh, I can't read big books like that. Reading isn't for me." You won't give them pride but a feeling of disgrace and failure that will leave them even more timid towards reading. In other times and places I have said that children don't deserve lesser writing just because they're children. Just because they don't have the experience to appreciate nuanced use of language. Quite the opposite, I say kids deserve the very best writing we are capable of, because you truly have their self-esteem in your hands. Conquering chapter books is a critical turning point in a kid's reading life. Thus, if you're going to take on the responsibility for that segment of their self-esteem, you damn well better take it seriously. Your story better reward them on every page to keep them buoyed up for the next page. More-so, if you can manage. If you're not up for that responsibility, please don't write for this age group. Maybe start out writing Adult or YA material and work your way down. But if you find yourself looking in the mirror and saying "kids really do deserve great books, and why shouldn't I be the one to write them?" then the question becomes what do you put in there so as to reward them appropriately. Chapter books are generally smaller stories. Not necessarily in their length, but in the scope of what the plot affects. They have a narrower focus, and stakes that are more intimate to the immediate lives of the characters. These are stories of personal situations, not fate-of-the-world stuff. Psychologically, you can create a layer of reward by recognizing that readers at these ages often read as a way of looking ahead to their own near-term futures. A seven or eight year old will often prefer books about characters that are a couple of years older than themselves, because they're looking for examples of the kinds of situations they'll be able to handle when they get to that age. It's a way of preparing themselves for the challenges that lie ahead. This gives you great guidance as a writer in picking the ages of your protagonists (target reader's age plus a couple of years), great guidance in what should be happening in your plot (what is challenging yet plausible for characters of that age to tackle), and great guidance in your marketing strategy (protagonist age determines who you should be marketing your book at). Plot-wise, I see two main styles in chapter books: Single-adventure stories vs. episodic stories. Single-adventure stories are what they sound like. The characters face a single central story problem, and the whole story leads up to that problem's eventual resolution. This is classic "hero's journey" territory, which you can google to your heart's content so I won't go over that here. Episodic stories for this age group tend to pick a semi-lengthy segment of time in the characters' lives, during which several smaller episodes take place, each involving a smaller-scale story problem. For the most part, each problem is fully resolved before the next one begins, though an excellent plotting technique is to overlap them so that one or two other episodes have begun before the first finishes. You can layer episodes at different scales, too: have a preponderance of episodes that are small (with or without overlapping), and one large-scale episode that builds slowly over the course of the whole book. Drama. This is nothing more than the emotional response readers have to their uncertainty about how an important situation will turn out. Does this page present an important situation that really could turn out well or badly for the characters? Or have you front-loaded it with so many clues and hints that everybody can foresee the outcome? Concern. Drama only works when the situation matters with regard to something the characters and the reader cares about. That is, when something important is at stake. Does this page introduce something new that is at risk in the story? Does it raise the stakes by showing that the story problem's outcome may be worse than the characters originally thought? Does it clarify the personal or emotional impact that would happen if the problem's outcome is negative? All of those work. Excitement. Fast-paced action sequences accelerate the heartbeat (and can be very funny, too, if done right) and provide a ton of enjoyable excitement. It's tempting to let these run on for several pages, but don't. Even action gets boring if it drags on forever. We've all seen action sequences, car chases, fight scenes and battles in movies where we found ourselves muttering "yeah, yeah, get to the point already". Don't drag them on that far. If you've got a page or two in a row that doesn't seem to be providing much reward, see if there's a way to amp-up whatever action is taking place on those pages, or to provide action as a backdrop for whatever else is going on. But don't write a bunch of pointless extra action. Curiosity. I am constantly astonished by how utterly terrified many writers seem to be of readers ever not knowing something for even half a second, and thus at how diligently they work to make sure all possible answers have been given before the reader ever has the chance to think of the questions. In reality, curiosity is a writer's best friend. Give readers lots to be curious about, then withhold the answers for a while. Curiosity is the fuel that makes readers continue to turn pages, because turning the pages is the only possible way they can find the answers! Readers enjoy the wondering. They enjoy trying to guess what the answer will be. Odd as it may seem, a page can reward the reader quite well indeed by raising questions to incite their curiosity. It doesn't take much. It can be as simple as introducing a box into the scene, then not opening it. Resolution. Of course, every question does eventually demand an answer. Don't leave us hanging. Receiving the eventual answer to something we've been curious about is very satisfying. I once taught a story-structure series to some fourth and fifth graders. My lesson on curiosity began with me reading a short scene--just a paragraph--which indeed introduced a box for the sole purpose of demonstrating how powerful even a simple mystery can be. I hadn't written the rest of the story, which practically torpedoed the whole lesson because the kids kept interrupting me to ask, "What's in the box!?" I said, "I don't know. I haven't written the rest." Drove them completely insane. So I wrote the rest and brought it for our next lesson. When they heard what was in the box--and also what dramatic stakes were associated with the contents of the box, plus the exciting action involved with learning the answer--they absolutely ate it up. All of the Ramona books are delightful, but I pick this one as an example to study because it does a great job on all of the points I've talked about above. Ramona Forever is essentially an episodic plot, as are most of Cleary's works. In this book, Ramona faces a number of situations she has to respond to in one way or another: a day care situation she's less-than-thrilled with, new responsibilities she has to live up to, the death of a pet (I still get choked up about that chapter. Jeez. ), a secret her aunt is keeping, and an impending new baby in the house. These situations span different scopes. The day-care situation is resolved fairly early on, but its resolution leads to the next situation about living up to new responsibilities. They don't really overlap. However, the situations involving her aunt's secret and the new baby are introduced early but don't resolve until quite late in the story. Indeed, the book closes with the birth of the new baby. The way Cleary overlaps these threads and weaves them together keeps the book feeling like there's always something new going on even while older questions are answered. Drama. The story quickly introduces a dramatic situation: is Ramona really going to have to spend her after-school hours at dreadful Mrs. Kemp's house, with equally dreadful, accordion-destroying hellion Willa Jean? She certainly doesn't want to, yet kids know that parents don't tend to be accommodating about such requests. Concern There are lots of little things all over the book for the characters are concerned about, and that readers can share in. But for my money, the most poignant moment is when the family's cat, Picky-Picky, passes away. This happens midway through the book, after Ramona and her sister Beezus know that their mother is pregnant, and have been given strict instructions not to create any unnecessary worries for her. When they discover the cat has died their immediate concern is that this will upset their mother, so they undertake the sad task of burying the cat on their own. Excitement. There's a great action sequence in the first chapter that delivers excitement by creating two threads of action running in parallel: Ramona's friend Howie Kemp being taught to ride unicycle outside by his uncle, while inside Willa Jean destroys the accordion her uncle just gave her. The narrative interleaves these two threads, like two card decks being shuffled together, to keep the action high. Curiosity. Cleary does a fabulous job of giving the reader things to wonder about. The very first sentence of the story opens with "Guess what," Ramona Quimby asked, which immediately prompts the reader to wonder what the surprise is. (Note: that's how you hook a reader, folks. Just give them something--anything--to wonder about.) The story slowly develops other curiosity elements as it drops hints about their mother's pregnancy, and reveals that their mother's sister, Aunt Bea, is hiding a big surprise too. Hitting curiosity and concern is the question Ramona has about how the new baby is going to affect their family, and how she will fit in as a middle child. Resolution. The "guess what" question, as it concerns something pretty small scale, is rewarded about half a page later when Ramona reveals that her friend Howie's supposedly rich uncle is coming for a visit. Larger questions get answered after amounts of time that are proportional to the size of the question. Aunt Bea's surprise is that she's getting married, which is big news but doesn't affect Ramona's life directly. Thus, that secret is revealed midway through when the wedding is announced. The biggest question--the existential one about the baby--lingers on, coloring the entire story up until the very end when the baby is born and Ramona discovers for herself how she feels about being a big sister. And all of it, from first page to last, is handled with a sensitivity to children's emotions that is simply lovely. Having a new baby coming, having extended family members get married, these things strike at the heart of the relationships kids have with the most important people in their lives. They are very normal, personal situations that tons of readers can relate to. In essence, Beverly Clearly has pitched the stakes in the novel at exactly the right level to appeal to her audience's core concerns, as well as to provide them with a realistic role model for how those situations can turn out. Finally, notice that the stakes in this book are very personal. They are intimate to Ramona Quimby's life and the lives of her closest family and friends. But realistically, there's not much reason for anybody else in the world to be particularly concerned--that is, to experience much drama--about how the story's situations play out. If Ramona really did have to spend all her after-school time at Mrs. Kemp's house, nobody would really care except Ramona. But to Ramona, that outcome is super-important. That's what I mean about small, personal stakes. The fate of the world does not even remotely hang in the balance, and yet still the story gives characters and readers alike an awful lot to care about. I don't mean to scare off any would-be chapter book authors by pointing out the sacred duty such books bear to their readers. I do mean to impress upon you the sacred nature of this trust, this responsibility to provide a rewarding reading experience. But I don't mean to scare anyone off, because it's not all that hard to create the rewards. I've given you five main story-reward categories to play with. All you really have to do is keep those things in mind as you plan out your story. When you're introducing a story-problem, be it for an episode or for the whole story, ask yourself how you're going to do that in a way that creates concern and curiosity. When you reveal a clue, ask yourself what question this clue is the answer to, and did you make sure to raise that question in the first place. Because if you didn't raise that question, then the clue comes as out of a clear blue sky, thus carrying no feeling of resolution with it. Keep the rewards in mind as you plan your story, as you write your story, as you revise your story, and all will be well.